Good. 16th Printing. Boards have some residue from the jacket to rear. DJ is quite worn with tears and chips-soiling stain marks and some loss, a few tears fixed with tape. Clean pages with a mild tone-previous owner name to ffep. Very Good. The leading thinking-book on the art of flying. Sewn binding. Cloth over boards. 400 p. Contains: Illustrations. After 60 plus years this book is still the absolute best basic introduction to flying. There are a few minor details that are dated but the science and the fundamentals still hold true. I first read my father's copy of this book in the 1950's and bought it on a lark just to compare it to some recent pilot introductory manuals. The explanations in Stick and Rudder appear to me more explicit than those in the modern books. Langeweische's style gets your attention too. While his writing is easy to read and enjoyable he also makes it clear that flying is serious business. 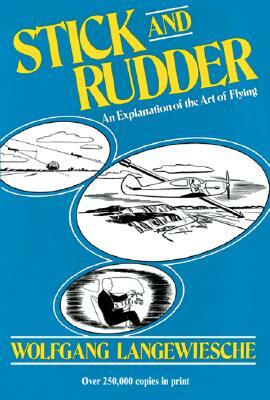 For anyone that is considering the 'art' of flying as a career or for pleasure, Stick and Rudder is a must read. Written decades ago, the same principles of flying still apply today. The author presents the basics of flying in a straight-forward manner and from a pilot's perspective. Simplistically written, Stick and Rudder gives any want-a-be pilot an understanding of what keeps a plane in the air. As a Commercial pilot and a CFI, I highly recommend this writing to all student pilots.